King County conducts monthly baseline water quality monitoring in Issaquah Creek at three sites. Station 0631, located near the mouth of the creek at the bridge on SE 56th (east of Lake Sammamish State Park), has been sampled since 1972. Station A631 is located on the mainstem upstream of the state fish hatchery and 30 feet upstream from the bridge on W Underwood Blvd. Sampling at A631 began in 1972 and continued until 2008 when budget cutbacks forced King County to reduce the breadth of its water quality monitoring program. Sampling resumed at A631 in February 2013. Station A632, located on the North Fork near East Lake Sammamish Parkway SE, was monitored from 1972 to 2008. It was then monitored from 2014 to July 2017 when construction began in the area. A new site for the North Fork of Issaquah Creek, station 0632, was established closer to the confluence with Issaquah Creek. Sediment samples have been collected from Issaquah Creek as part of the Streams Sediment Monitoring Program starting in 1987. 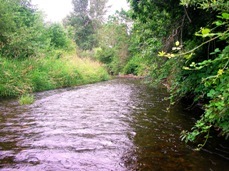 King County began collecting benthic macroinvertebrate samples in Issaquah Creek in 2005. From time to time, additional studies have been conducted on Issaquah Creek. Click here for information about Special Studies. The headwaters of the Issaquah Creek Basin originate from the steep slopes of Cougar, Squak, Tiger and Taylor mountains. The basin encompasses about 61 square miles and includes Holder, Carey, Fifteen-mile, and McDonald creeks as tributaries to Issaquah Creek. The basin is one of the three most significant basins in urbanizing King County. The upper and middle Issaquah Creek Basin is identified as a Regionally Significant Resource Area because of its exceptional fisheries habitat and undeveloped character (Kerwin, 2001). Carey and Holder creeks in the upper basin provide particularly excellent habitats for salmonids. Total land use in the basin is characterized largely by forestland and developed land. The remainder is in agriculture, scrub, wetlands, and other (barren land, grassland, and open water). Forestland consists mostly of mixed and evergreen forest while the majority of developed land ranges from low to medium intensity (some high intensity) and open space. See Table 1 below for more details on land use. Over 40% of the land is in public ownership with Washington Department of Natural Resources, Washington State Parks, King County Parks, and City of Issaquah Parks. Issaquah Creek has been identified as a Regionally Significant Resource Area because of its exceptional fisheries habitat, though the expected population growth within the basin (18% by 2020) could threaten this status. Eight species of salmonids (six anadromous) are known to utilize the Issaquah Creek basin. The Issaquah Creek Hatchery at river mile (RM) 3.0 currently produces Chinook, coho, and Lake Washington steelhead. Fish not used for production are allowed to spawn in the natural habitat of the creek (Kerwin, 2001). An early-run kokanee stock is also present in Issaquah Creek. Volunteers with the Salmon Watcher Program made observations within the Issaquah Creek basin from 1996 to 2015. Chinook, coho, and sockeye salmon were observed in the creek. Cutthroat trout and kokanee salmon were also observed, but less commonly seen. In 2001, volunteers began making observations in Holder Creek. For more information about fisheries in the Issaquah Subarea, please visit the Issaquah Creek Subarea webpage. State water quality standards were revised in 2003. Issaquah Creek and its headwaters are now categorized as “Core Summer Salmonid Habitat” for aquatic life use, with the exception of Holder Creek, which is designated as “Char Spawning and Rearing Habitat”. As part of the updated water quality standards, Issaquah Creek has been assigned an additional “Supplemental Spawning and Incubation Protection” temperature criteria of 13 ºC to be applied from September 15th to June 15th. The creek is designated as “Primary Contact” for recreational use. The creek is on the Washington State Department of Ecology’s (Ecology) 303(d) list for violation of DO and water temperature standards (Category 5). The creek has an EPA-approved Issaquah Creek Basin Bacteria total maximum daily load (TMDL) plan in place and implemented for FC bacteria (Category 4a). A 25-year (1979 – 2004) trend analysis was conducted with baseflow water quality data showed some significant changes in the water quality since 1979. Improvements in water quality at the mouth of the creek (0631) are evident by a significant decrease in ortho-phosphorus, nitrate, and total nitrogen. Near the mouth of the North Fork (A632) there was a significant decrease in ortho-phosphorus, total phosphorus, nitrate, total nitrogen, turbidity, total suspended solids, and FC bacteria. However, there was a significant increase in ammonia at station A632 during this same time period. At the upstream station (A631) nitrates and total nitrogen concentrations decreased significantly, but there were significant increases in ortho-phosphorus and total phosphorus and a significant decrease in DO. All three stations showed a significant increase in water temperatures and conductivity. A Water Quality Index (WQI) rating system was developed by Ecology that evaluates several water quality parameters and gives a single rating of “high,” “moderate,” or “low” water quality concern. To see how the WQI ratings at Issaquah Creek stations compare with other stream sites, please visit the Water Quality Index webpage. King County maintains two streamflow gages on Issaquah Creek: North Fork Issaquah Creek (46a) and North Fork Issaquah Creek in Grand Ridge (46t) and one water temperature gage: Issaquah Creek at SE 56th Street (25A) . Sediment data were collected from Issaquah Creek as part of the Stream Sediment Monitoring Program starting in 1987. Data were compiled and analyzed for the years 1987 through 2002. Data analysis identified no significant trends for any of the parameters tested. Sampling of the legacy site, 0631, continued through 2010 with basin wide sampling occurring in 2008. Comparison to sediment quality guidelines show sediments in the Issaquah Creek basin exceeded the Sediment Cleanup Objective (SCO) for nickel at site 0631 and for bis(2-ethylhexyl)phthalate at C631. No other SCO levels were exceeded. The acid volatile sulfide/simultaneously extracted metals (AVS/SEM) ratio at 0631 suggests that metals are not bioavailable at this site, so adverse effects to benthic animals are unlikely. For more information about benthic macroinvertebrates and King County’s Benthic Macroinvertebrate Program, please visit the King County Stream Bug Monitoring webpage. To see the benthic macroinvertebrate data for Issaquah Creek, please visit the Puget Sound Stream Benthos webpage. The City of Issaquah partnered with volunteers to restore parts of Issaquah Creek in 2006. The main activity was removing invasive vegetation and replacing it with shading vegetation. School teachers are adopting sections of the creek and including stewardship in their curriculum. This project was partially funded by the King County Waterworks Grant. As part of King County's Small Streams Toxicity/Pesticide Study, pesticide concentrations and toxicity were measured in Issaquah Creek in 2001. The County collected samples for analysis of pesticides, other organics, metals, suspended solids, and toxicity (Ceriodaphnia dubia, and Selenastrum capricornutum). Parts of the Issaquah Creek Subarea have exceptional fish habitat. The Subarea supports chinook, coho and kokanee salmon and steelhead trout. Numerous studies have been conducted in conjunction with basin planning and salmon conservation efforts to improve salmon habitat.